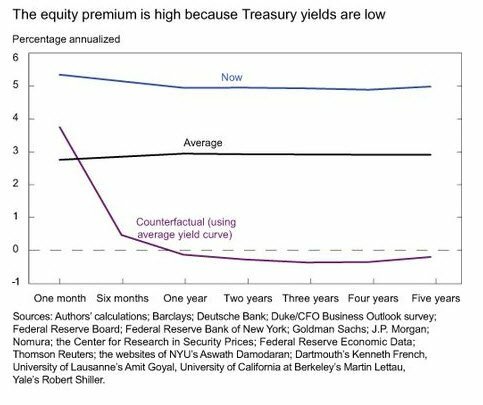 This is a brief article on the impact of Monetary policy on treasury interest rates, which impact equity market valuations through the Equity risk premium.. 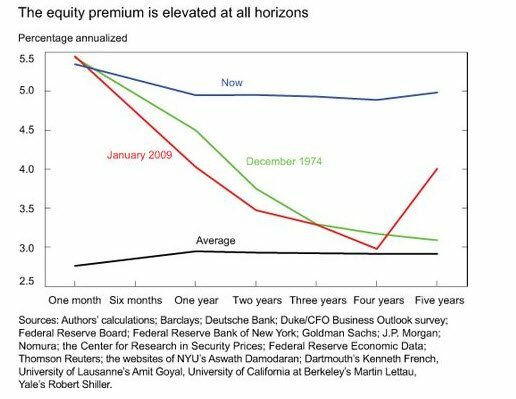 The New York Federal Reserve released an article by Fernando Duarte and Carlo Rosa May 22, 2013 titled “Are Stocks Cheap a Review of the Evidence” supporting the notion that the low-interest rate environment, caused by the feds actions, produces excess equity returns such that the equity premium has reached historic highs. 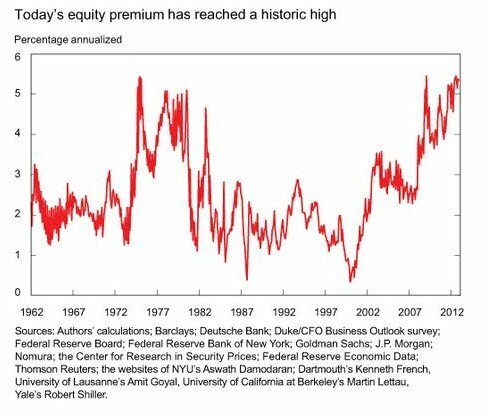 Many of you may have seen articles suggesting that the stock market is not overvalued based on historically high profit margins and which produce PE ratio‘s that are lower than they were in the 1990′s even though prices are higher today. It’s believed the PE ratio’s today are pricing in future expected declines in profitability, because corporate profit margins tend to inflate and decline in cycles. Given the fed’s statements that it is their intention to keep rates at or near where they are for years until labor markets improve and that low interest rates have helped to improve corporate profitability we may see historically high profit margins for years with or without the intended impact on labor markets. What we can conclude from the information in the charts is that if you truly believe bonds are risky to own because you believe rates will rise resulting in bond prices falling, you should view equities as being similarly risky because of the negative impact on equity valuations due to what would be a shrinking equity risk premium due to a higher discount rate being used to value stocks on a risk adjusted basis. The discount rate being the the interest rate of the 10 year treasury.